This is based on a dish I used to have at a restaurant in Tokyo and loved! 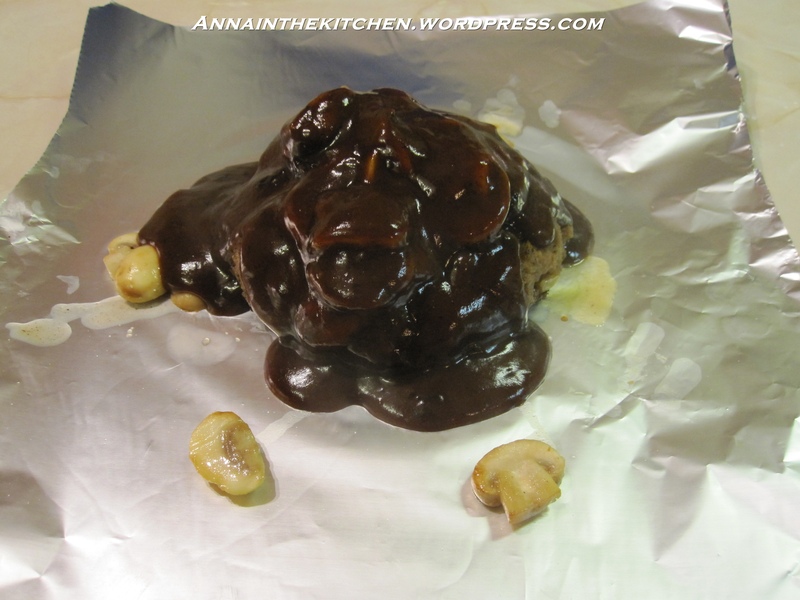 You don’t technically have to serve it in the foil parcels as I have but it does give the meat time to take up a little of the flavour of the sauce and you can get on with other things while you leave them in the oven so it’s a good prep ahead then pop it in the oven meal. This was usually served with a baked potato but I chose to have chips tonight as I was in the mood. I’ve also had the burger wrapped in bacon and served with a different sauce or may be no sauce but I can’t for the life of me remember! I’m working on it. This is a good basic hamburger recipe too and I’m sure would make an excellent burger in a bun on its own. I love Japanese style Western food. So often they take a staple Western food and do wonderful things with it that we would never have thought to do because we’re so used to doing something particular. Although I am informed that this is similar to a Salisbury Steak in America. What I do know is it’s delicious! I’m dying of cold at the moment so if anything doesn’t make sense here drop me a line and I’ll fix in once I am able to breathe and think again! – First lightly fry the onion in a little oil until soft. Allow to cool a little. – Put everything in a bowl and mix it together with your hand. – Divide the mixture roughly into 6. – Gather a portion of the meat in your hand. 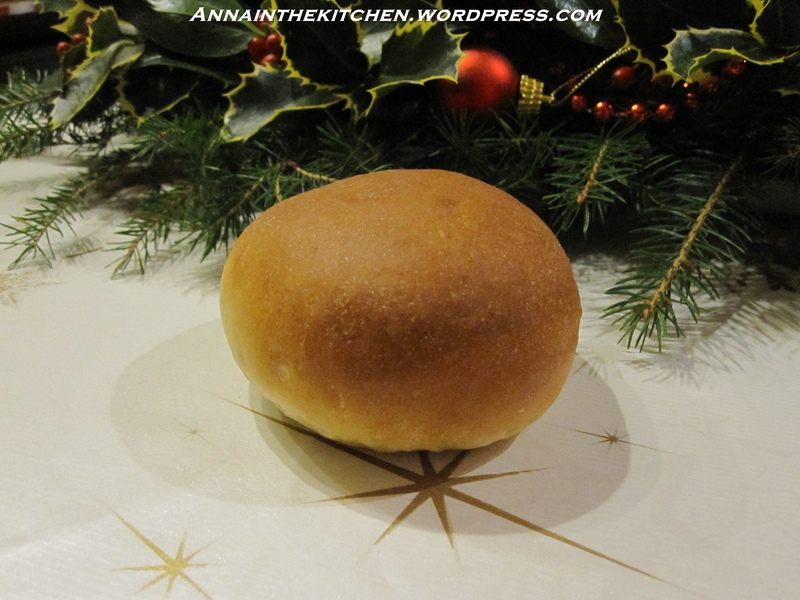 Roll into a ball then throw the ball forcefully back and forth in your hands to force out the air and flatten it into a patty. – Place the patties on a large plate or chopping board and chill in the fridge for at least 30 minutes, preferably about an hour. 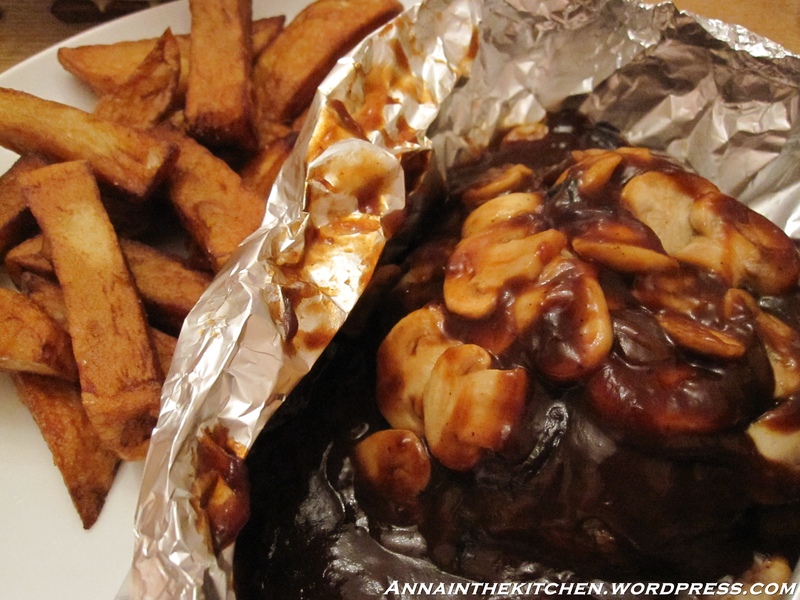 – Melt a small knob of butter in a frying pan and fry the mushrooms until just browning. Set aside. – Sprinkle the burgers with a pinch of salt and prepare the foil sheets. – Fry the burgers in a large frying pan or griddle. Give about 4 minutes each side. Don’t move the burger about once you’ve placed it in the pan until it’s time to turn it or it will fall apart. 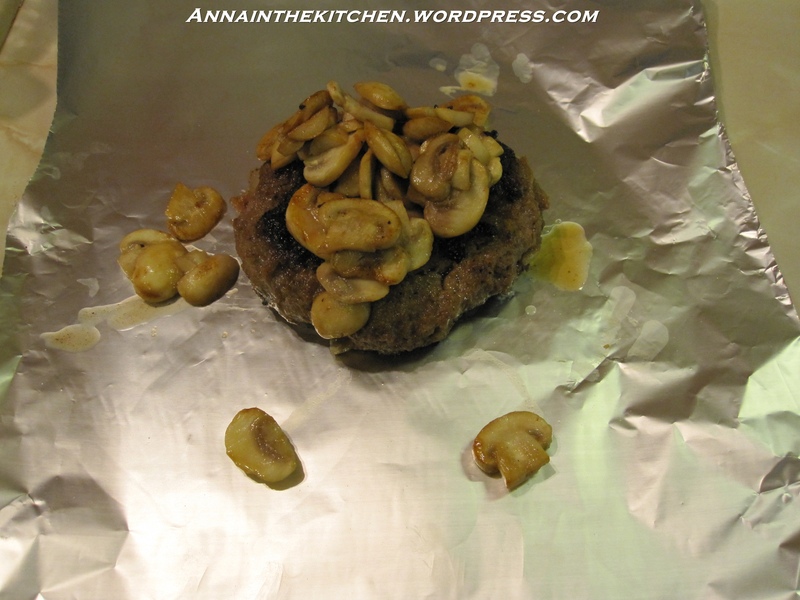 – Place the burger in the centre of the sheet of foil and top with a spoonful of mushrooms. – Deglaze the pan with red wine (tip it in and scrape off any cooked on bits). – Add the stock and reduce until starting to thicken. – Add the ketchup and stir in continue to reduce. – Pour a little sauce over each burger. 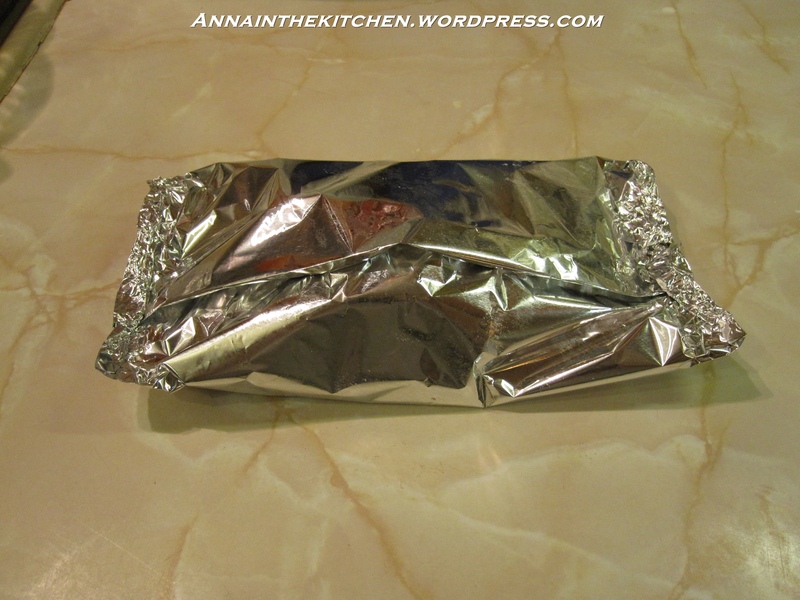 – Fold the foil up into a tent and fold together the edges to seal. Then fold in the sides to seal those. – When you’re ready simply put the parcel on a plate to serve. * I only cooked sauce for 1 tonight so I can’t speak as to actual quantities. I just poured! I’m all for oven chips. They’re great. Not much fat and the perfect vehicle for sauce. But you never eat an oven chip and go, “mmm”, do you? Sometimes you need a proper deep fried chip. Fat be damned! Tonight was one of those nights. I was afraid of the deep fat frier for a long time. It’s boiling oil!!! But I faced up to my fears one night and discovered that actually, it’s not so scary after all. So long as you’re careful and don’t go sticking your fingers in or anything like that it’s not the hideously dangerous exercise I thought it might be! I’ll fry all sorts of things now where previously I’d have found a way round it so give it a go! You might just surprise yourself. Allow about 2 average potatoes per person. Judge it by eye. – Switch on the deep fat frier and allow it to get up to temperature. – Peel the potatoes and cut into half, or thirds, dependent upon the size of your potato and then slice into chip sized chunks. – Scatter into the frier to separate out the slices. If you have more chips than cover the bottom of the basket then do this in batches. – Lower the basket into the oil, shut the lid and cook for 6 minutes. 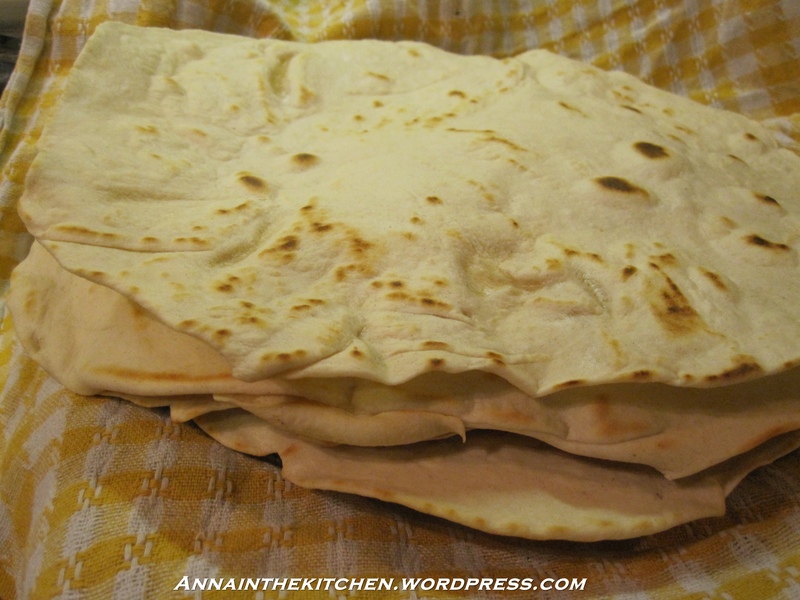 – Take out and put in a warm dish lined with kitchen paper and keep warm. Cook the next batch and do the same then set aside while you cook the rest of the meal. 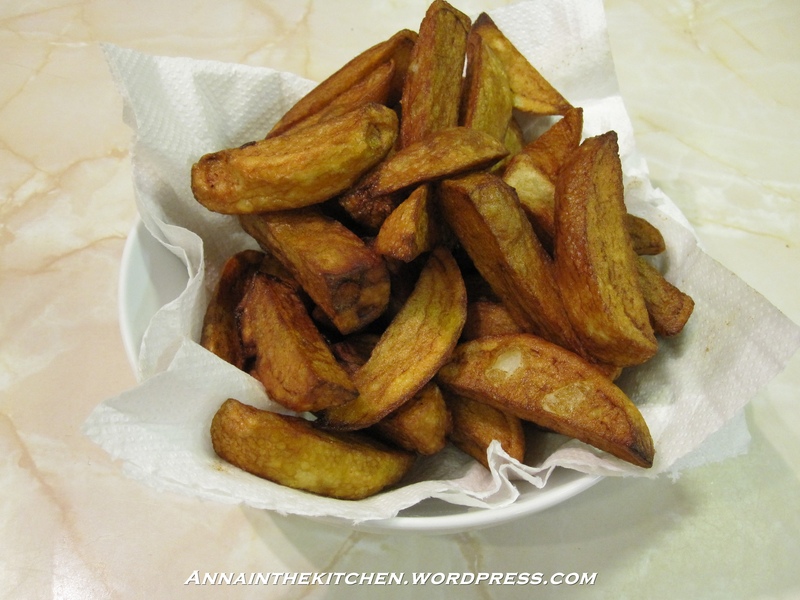 – Just before you are ready to serve tip the chips back into the fryer in one batch and fry for another 2 minutes. – Tip back into a warm, lined bowl and serve. I always serve with a sprinkle of ground salt but if you’d rather add salt at the table then do so. This isn’t a food post but I did spend a good hour in my kitchen today doing this as well as picking all of the things to make it so I thought I’d post it here. I like flower arranging, having fresh flowers in the house is such a simple thing that makes such a difference to my mood. During winter I usually prefer not to have the gaudy out of season flowers you see in supermarkets and content myself with some roses. But Christmas gives me an excellent excuse to exercise my more extravagant side! I admit I may have got carried away! But I picked everything myself and it all came from within a mile of the house, how’s that for economical! I had a lot of fun doing this and had to use all of the tricks I learned during my classes in Japan to get this to work. 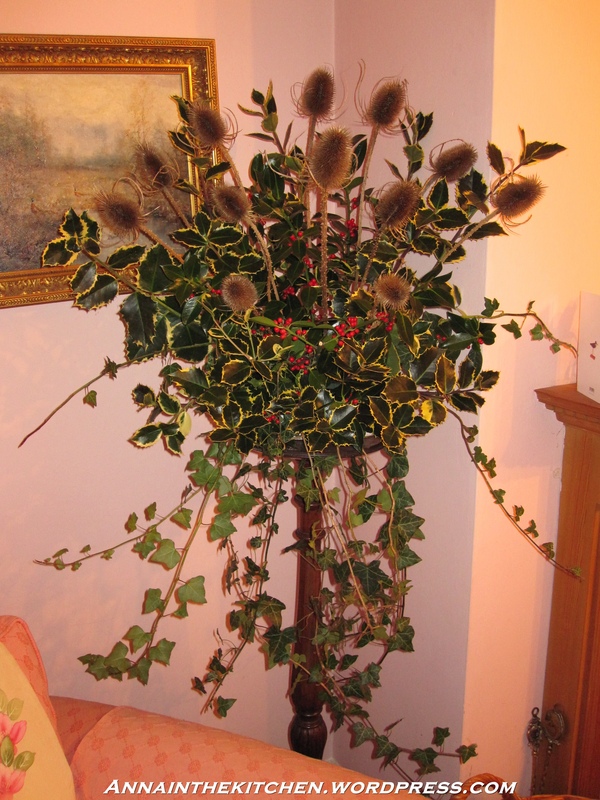 My hands are prickled all over, teasles are a nightmare on their own but holly and teasles together can be plain torture! It’s a shame I don’t go to church as I do have a tendency to lean towards church sized arrangements. 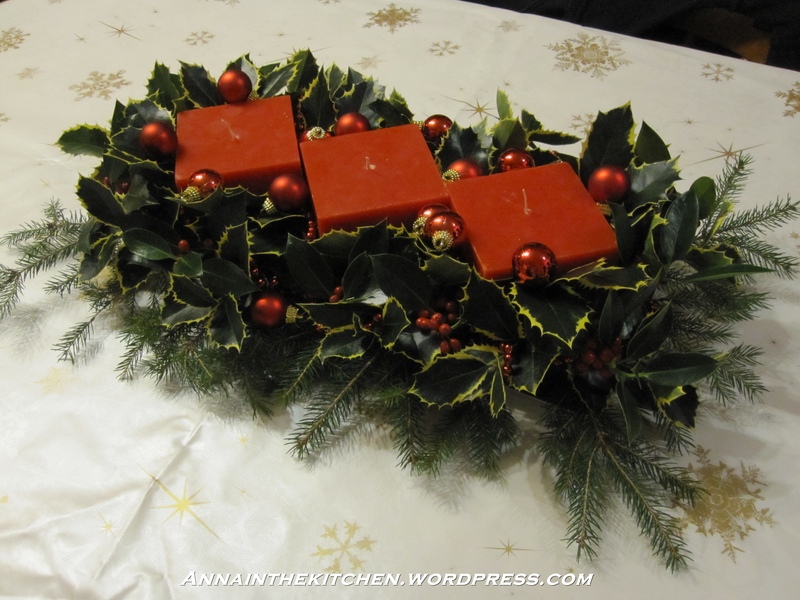 I’m doing a table centrepiece tomorrow that I shall try to keep in scale! I finished the centrepiece! It’s more or less the size I wanted it too. I also bought a new christmas tablecloth. It’s made of that plastic material (PVC?) so all spills can be dealt with. I’m taking a break from the holly after this, my hands are ruined! What with that and rootling in hedges for sloes and crab apples I’m scratched to bits! Wow, what a week it has been! I’ve been pushing my cooking boundaries already this week and I had to do it again today with the Tortillas. It’s been a busy few days and I lost a few hours to that little mishap. I’ve updated the index here again and I’m going to try to keep on top of it this time. I’m coming up on 100 recipes! Yes, there will be cake. 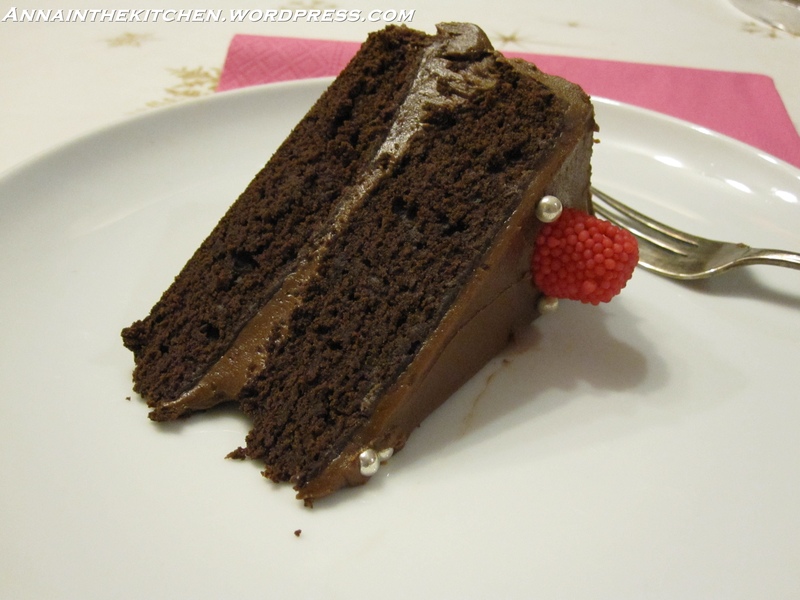 I’m generally working hard to get this blog to be the best I can make it. I’m also hoping to also be able to participate in Adopt-A-Blogger #4 over at Dine & Dish which will hopefully mean improvements around here. But that’ll be after the christmas madness. I’m already preparing to go gourmet with the gifts this year. I have a bunch of recipes lying about that’ll be just perfect for so-and-so so I’m gearing up to get cracking with those. I hope you’re all getting ready for an excellent holiday season, I know I’ll be stepping up on the Christmas recipes any day now! Anyway, on to tonight’s dinner! These Layered Enchiladas were just supposed to be ordinary enchiladas, however, due to the supermarket tortillas going off and my first attempt at tortillas turning out rather brittle I had to go for Layered Enchiladas. I have to say I am impressed with how well they turned out. Instead of having a wrap we each ended up with a slice of ‘enchilada pie’, which was actually really handy for portion control. This certainly went down well with my dad who asked for seconds, which is almost unheard of! 1 pack tortillas or make your own with my recipe here. – First make the sauce. Saute the onion and garlic with a pinch of salt in a little oil until soft. – Then add the chicken and stir until cooked all over. – Add the chilli powder and chopped chilli. Stir well. – Pour in the chopped tomatoes with a little water to rinse out the tin. – Add the sugar and tomato puree and stir until mixed. – Bring to a simmer and add the green pepper. – Simmer for 15 minutes until the sauce thickens. – Place a tortilla on the bottom of the baking dish and sprinkle lightly with grated cheese then add a few spoonfuls the sauce and spread over the tortilla. – Add another tortilla on top. Pour a little passata over and spread over the tortilla. Sprinkle with cheese. – Add another tortilla and sprinkle with cheese. Add sauce and spread out. 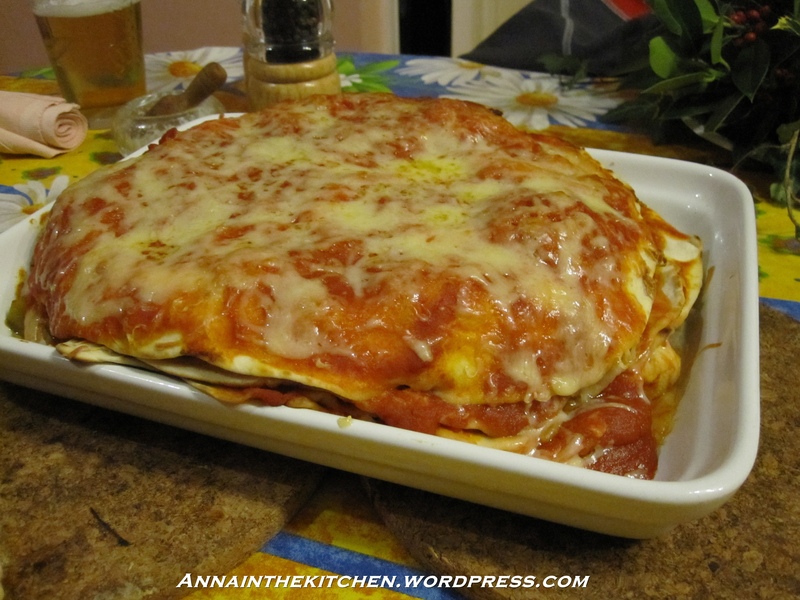 – Repeat alternating layers of sauce and passata until all of the tortillas have been used making the last layer passata covered with a good layer of cheese on the very top. 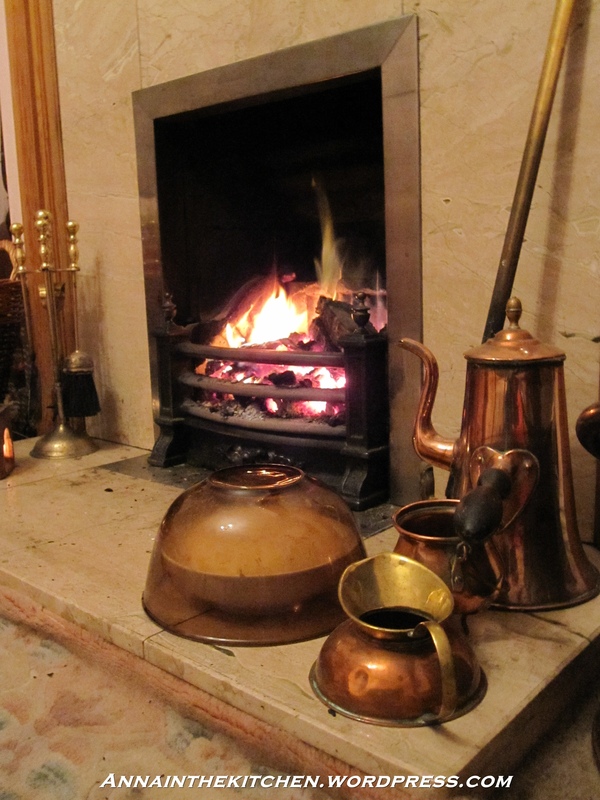 – Bake in a hot oven at gas mark 6 for around 20 minutes until the cheese is melted and everything warmed through. 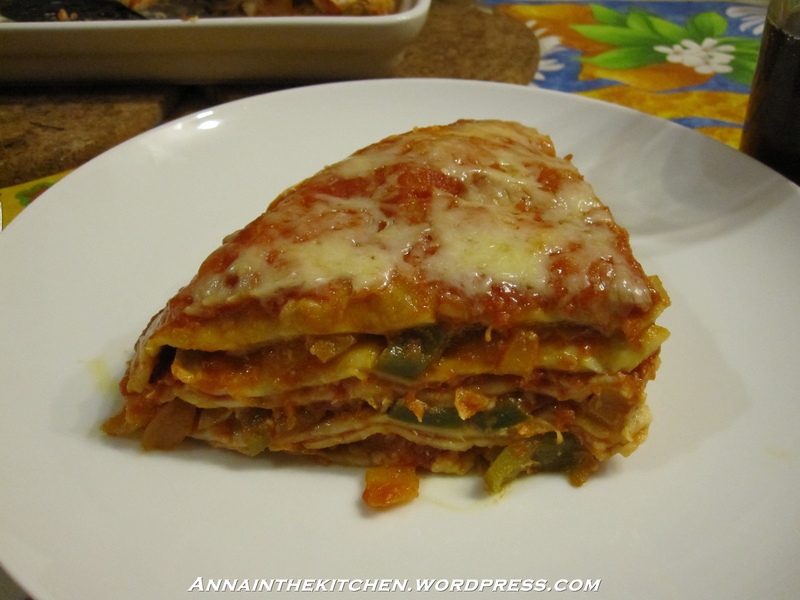 – Serve in slices while hot. It’s really good with creme fraiche and avocado slices.